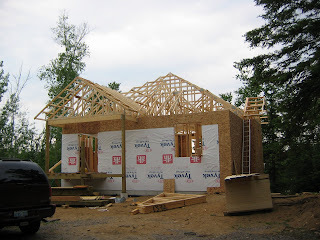 Cottage on the Edge - the DIY Cottage Blog: Raising the Roof! Well after trials by rain and sheer sweat and muscle power, the framing of the main part of the roof is complete. This picture shows the front of the cottage, and hence you can see the central hip roof with the two gabled dormers - one on the front and one on the side. Actually the one on the right is still incomplete in this picture - there are two small trusses that need to go in behind the gable end to complete the dormer. The worse part of the whole job was getting the trusses first up on the roof. This was accomplished with the sweat and muscle mentioned above. Fortunately I have three adult, and string sons. Three of use would pick the truss up and bring it up as close to the cottage as possible. The fourth held a 12 foot 2x4 with a v-notch cut in one end. First we would orient the truss so that it was in the position when we eventually got it up on the roof. We wished to have the foot(bottom) of the truss facing the lakeside, and the head (top) facing towards the front of the cottage. The position on the ground was such that the it was length ways parallel to the front wall of the cottage. Two of the truss movers, those closest to the cottage, would lift the truss up as high as they could. The v-notch 2x4 would then be used to help them push the end of the truss over the top of the front wall. One of the two truss holder then quickly ran up inside the cottage and up a ladder to grab the truss. The process then consisted of pur brute strength pushing and pulling the truss up and over the front wall until about half of the truss was on the roof. The v-notch 2x4 person would use this 2x4 to push up and hold the end hanging overhead while another person joined the one already inside the cottage and pulled the rest of the truss onto the top of the walls. As they were pulling it in they also spun it around so that the truss was now parallel to the front wall with the foot of the truss facing the lakeside. The trusses are not that heavy. Two people can actually lift the heaviest at 205 lbs, however, they are awkwardly shaped, and quite fragile while horizontal. It fact we damaged one of the trusses getting it up ion the roof - one of the joints bent. Fortunately, we were able to hammer it back into position. It brute force mode, we placed all of the big trusses up on the roof in the order that we would need to install them.